Designers Monica and Jess help a husband completely redo their dilapidated kitchen as a surprise for his wife, turning it into a magazine-worthy dream kitchen in just two short days with a budget of $2,500. Franco wants to surprise his wife, Stacy, by sending her away for the weekend and letting her favorite bloggers redesign their kitchen. Right now, the space needs a major makeover, with old cabinets and countertops that are falling apart. Although Franco's budget is bigger than Monica and Jess are used to - $2,500 - he needs this entire kitchen completely redone in just two days. Franco's wife Stacy loves high-end finishes, like hardwood floors, beautiful cabinets,and granite countertops. The kind of kitchen she loves could easily cost more than $30,000, but Monica and Jess are determined to create a high-end look for way less and in short order. Based on the inspiration photos, Monica and Jess want to make a fresh modern kitchen with more open space. Their first suggestion? To get rid of the wall between their kitchen and dining room. "It's going to connect your dining room and kitchen and really help for the family and entertaining," says Monica. "It will make the space look so much bigger." In place of the wall, Monica and Jess want to build an island, like the ones in Stacy's inspriation photos. But their plan hits a potential snag when they find out about a large radiator in the middle of the kitchen. They plan to move the fridge and stove, and Franco has a dishwasher and microwave ready to install as part of the new kitchen. To update the couple's dated kitchen cabinets, the bloggers plan to paint the cabinets and add molding and hardware to give them a high-end look. They also plan to give the countertops, floors and backsplash new finishes that will look beautiful, but fit in their budget. Since the team has to accomplish this all on such a short time frame, and minus one homeowner, Jess and Monica call in a special guest, their friend and carpenter Mark Bartolomeo. Mark takes a look in the basement and says he thinks the kitchen wall can come down and the radiator moved, but the materials will cost $150 to $175 and take about three hours of work. The team begins taking out the radiator and demolishing the wall. Monica and Jess start the process of redoing the kitchen cabinets, using a nail gun to apply lattice trim to the border and down the middle of each door. But just as they get going, the weather interrupts them with torrential rain. The powertools and all of the wood for the cabinets get completely wet, putting the team behind when they're already on short on time. The second day begins with the discovery that the team's work tents have been destroyed by the rain. It's supposed to rain again, and now the team has no where to work. They did make some progress last night, finishing the demolition, putting in the plumbing for the new heating element and getting started on the painting. But Jess and Monica estimate they've still got 80 percent of the work to do, with only 10 hours to go. Next, Mark and Franco get to work on the kitchen island, using standard kitchen cabinets as the base for the project. Rather than using granite like Stacy's inspriation photos, the team decides to install butcher block countertop, which is much more budget friendly. The countertop for the island cost just $179, compared to the $1200 to $1800 a similarly sized piece of granite would have run. Monica and Jess work on painting the couples cabinets. The duo is creating a two-tone effect by painting the upper cabinets white and the bottom cabinets a trendy slate blue. Next, the team works to install the rest of the butcher block countertops and a beautiful sink that Monica snagged for just $200. Jess and Mark work to install the dishwasher, something Mark says is relatively simple and takes just 15 to 20 minutes. While a plumber would charge a few hundred dollars to do the installation, Mark says most homeowners can do it themselves for free. With so much left to do, Monica tells the team that Stacy is set to arrive home in less than 2 hours. Everyone is scrambling to finish the remaining projects. When Stacy arrives, Franco does his best to hold her off so that they can finish cleaning and accessorizing the kitchen. The beautiful new kitchen brings tears to Stacy's eyes. "It's amazing. It's not even the same room. I don't even recognize it," she says. Stacy loves the cabinets, especially the depth created by the contrasting colors. Monica explains how the team took out a few of the wood doors and put in glass instead, giving the room a high-end feel but without the price tag. Without the wall dividing the kitchen and dining room, the house appears more spacious. Stacy is also excited about the new appliances - the microwave and dishwasher - now installed, instead of sitting in the basement. So, how did the team accomplish this all on a $2,500 budget? Refacing the cabinets cost $300, and the new kitchen island $499. The additional countertops cost $300. The duo spent $205 on the tile for the floor and the backsplash. Everything else - the sink, the lighting, fixing the radiator and all of the new accessories - cost $1134. The grand total? $2498! "I've been doing kitchen renovations for a long time, and I'm very impressed that Monica and Jess got this kitchen done for $2,500," said Mark. "This could easily go for 20 to 25 grand." "It's amazing, and I feel so blessed," said Stacy. With a budget of $2,500, designers Monica and Jess create a plan to completely makeover a cramped, old-fashioned kitchen for a husband to surprise his wife. Brand new kitchen cabinets are expensive, so Monica and Jess show how to save money by transforming outdated cabinets with paint, trim and new hardware. Here's how to give your cabinets a facelift with this easy DIY project. Franco and Stacy have always wanted an island in their kitchen, but having one made can cost thousands. Carpenter Mark Bartelomeo shows Franco how to create a DIY island out of standard kitchen cabinets. Can't find a kitchen floor mat that matches your decor? Designers Monica and Jess show you how to create a custom mat out of fabric you love with this easy DIY project. Installing a dishwasher is easier than you think. Try it out with these simple steps. Get step-by-step directions and see detailed photos of the DIY projects from the kitchen renovation. 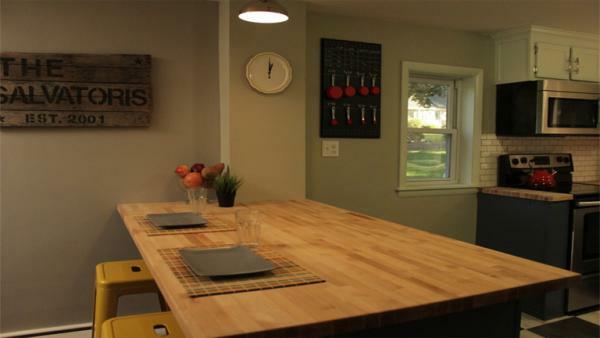 See how Monica and Jess transformed this small, outdated kitchen to a beautiful, open space.